If you recall last year I described how I built my hot beds to propagate my tubers. make my own LED grow lights. Below you can see all 4 lights above the two hot beds. Each light is 500mm wide. How much light is required? I have just the last page on What about??? to fill in. 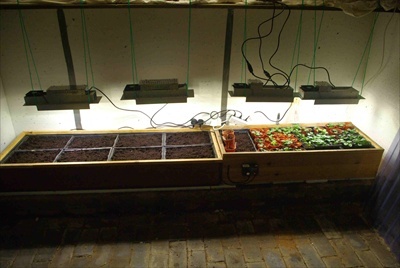 The grow lights are up and running - seem to be OK. Half the tubers have started. I will update as time goes on. I hope you enjoy the topics. me: Rob - click here to e-mail. 1st Cuttings!! 8th February 2011 25 days for setting up. 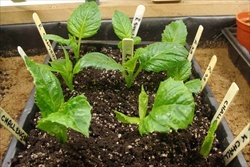 Ruskin Sunshine & Kenora Challenger 1st cuttings. So I shall see how they root - hopefully better than last year's cuttings. Rooting Medium is peat & Perlite 50:50.